1. 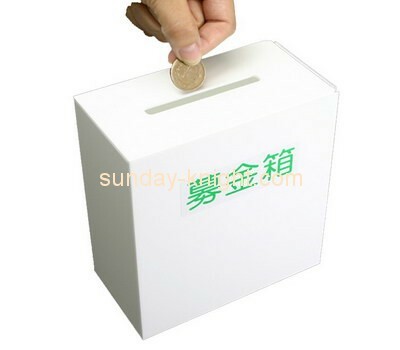 Product name: coin donation box. 2. Material: acrylic/ plexiglass/ lucite/ perspex/ plastic. 4. Color & logo:can be made as your request. 6. MOQ:	normal 500 pieces, depend the specification of products. 8. Sample time:	3-5 working days for normal samples. 9. Payment terms: T/T,Western Union,PayPal.